Celebrate our country's birthday with Braswell Family Farms, a fourth-generation family farm that has been providing quality eggs and feed to American families for 75 years. We put together a few recipes with a little help from our partners at Eggland's Best that we hope you and your family and friends will enjoy this Independence Day. God Bless America! These cookies are cake-like and the perfect dessert for a summer cookout. Follow our recipe for a sweet, creamy filling, or fill with a dollop of your favorite ice cream or whipped cream! A 4th of July cookout is not complete without baked beans. The TermiNatetor Kitchen improved upon the classic by adding our delicious eggs to the classic dish. God Bless America! Nothing says Happy Birthday America like apple pie. 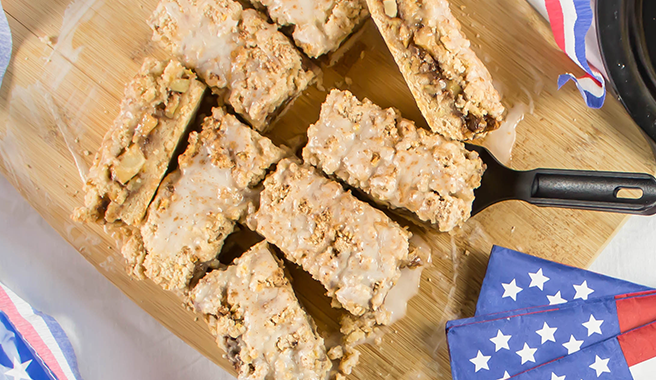 These bars allow for the delicious 4th of July staple to be taken on-the-go, from the boat, to the beach, to the neighbor's cookout by the pool. Do you have a favorite 4th of July recipe? Share it with us!